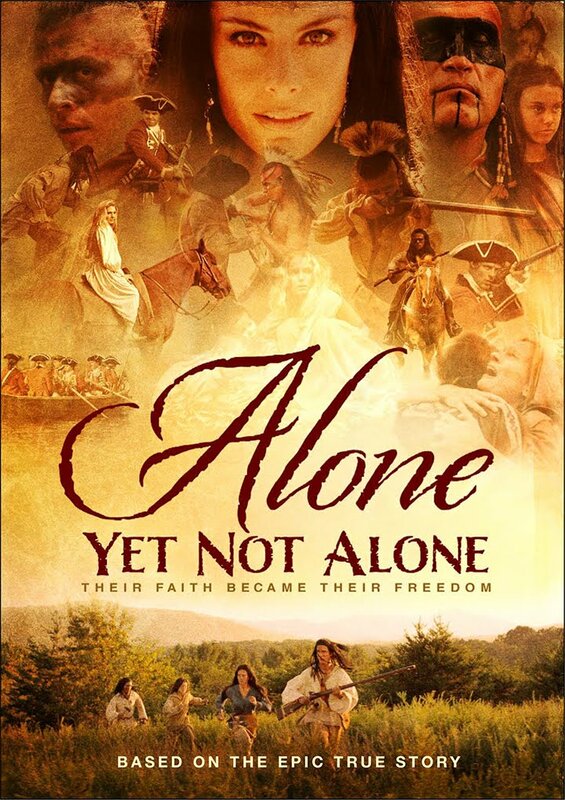 Based on a true story, Alone Yet Not Along is set in 1755, in colonial America, where the British and French are battling for supremacy, and the Natives have tired of being pawns of the British. When the French offer money for English scalps one hostile tribe goes on a rampage, killing farmers and homesteaders, and taking the women and children captive. Among the captives are two newly arrived immigrant girls from the Leninger family. The Natives kill their father and march the girls 300 miles inland, far from anyone who could save them. When they arrive in the Native village their hair is dyed black and they are told to live as Natives. When they get older they will be expected to marry into the tribe. So who can they look to for help in such fearful circumstances? They know, because they have been taught by their father, that their God in Heaven will never forsake them. They may be alone, but they are not alone. One big plus: no theological weirdness. In many a Christian film miracles abound, even though that is not how God commonly interacts with us. But here, though God never abandons his people, a lady still ends up getting cruelly killed by the Indians. Because this account is rooted in history, the theological underpinnings of the film are grounded in reality. 1) This is a typical Christian film in that it lacks subtlety. For example, one dirty but still healthy-looking girl complains that she is soooooo hungry because she hasn't eaten for three days. It would have been nice if they could have shown us that, rather than tell us. The acting is generally solid, but it's also evident there are a lot of first-time actors (including Brett Harris, author of Do Hard Things) with some awkward accents. And the foreshadowing is not very "fore"; immediately after the older sister promises to never leave the younger the two are torn apart and sent to different villages. 2) Regarding historical accuracy, I have only a limited familiarity with this time period, but I think some of the events have been oversimplified to the point of caricature. One example: the British General Edward Braddock is portrayed as deliberately antagonizing his Indian allies, listening to no one's advice, and just generally having no tact and no common sense. Could he really have been this stupid? 3) With Natives and British and French fighting each other, as you might expect, there is some blood shown. But overall the violence is of a "1940s cinema" sort, with a good deal of it happening just off screen. Still too much for young children, but probably not a big deal for any teens. This is a good but not great film, with some flaws that'll warrant it a "6." I don't rate many films that are less than a solid 7, preferring to focus on the better films. So why the exception this time around? Because while there are better films out there, Alone Yet Not Alone is not only decent but safe for almost the whole family (certainly teens and up). The violence is tempered, no one takes God's name in vain, there's some action, and the whole thing has a nice happy ending. It's a movie no one is going to rave about, but also one that most in your family will be able to find something to enjoy.